Tuesday at B&N . . .
Ruth Imhoff started the night with Chapter 1, The Motto of the Hound. Ray suggested using the coroner’s name once we learn it. Nice set-up, good intrigue. Daniel as a detective, though, should be cataloging the crime scene. Throw in some clues, more details. Jen thought the voice was a little passive. Need more action, too much being told what’s going on. Rebecca lost track of the relationship of the characters at points. Wasn’t sure who the nemesis was… could be point of view issues. Carol thought it was a good set-up, especially the line about Daniel being back from personal leave – what happened? Mike R. shared a couple of poems with us. Holly thought the line about “love for all” could be clarified a bit, and Carol spotted the use of the word “lost” in quick succession. Rebecca thought the line about spontaneity was a bit convoluted, but enjoyed the details in the resot of the poem. Katelin liked the first poem better, as the imagery stood out for her more. Ray liked the line about ambivalence relating to the strength to do right. Katelin Cummins offered scenes from her new idea, Viera. Holly wondered if you would describe a paint color as mysterious. There was some concern about the boyfriend’s comment (“Sculpting again?”) as being too obvious, but Carol heard it as more of a weary, “Oh, you’re lost in your sculpting again, aren’t you.” Ray pointed out some tense change issues. He liked the dialog a lot – it felt very true. But build up the moment where the statue speaks. Holly suggested writing the ending – once you do that, you’ll know where the story has to go. Bill Eisinger brought in a rewrite of “Conflict.” Andy felt the main character was heartless and unlikeable, but the cop’s comment about arresting him was a bit unrealistic. He also wondered if the person in the school would call security right away. The rest of the group said “yes,” she probably would, especially these days. Katelin sympathized with Maria – she didn’t really do anything all that awful and the main character is overreacting. Rebecca felt this version had a better dramatic build-up, and Holly commended Bill on how much growth his writing is showing from draft to draft. Carol Hornung read a scene from Ghost of Heffron College. Some people are still having trouble with the male ghost having the name Brandi, and Rebecca said the people at the party weren’t nearly high/drunk enough. Andy agreed, feeling the partygoers were there more for the pizza rather than the booze and pot. Holly thought there should be some music playing in the background. Maybe turn off the music to tell the ghost stories. Ray had a hard time picturing a strange shaped shadow. What’s so strange about the shadows? June 4: Lisa McDougal (chapter, Tebow Family Secret), Betsy Draine (chapter), Bob Kralapp (??? ), Michelle Nightoak (chapter, memoir), Alicia Connolly Lohr (novella, chapters 7-8, Lincoln’s Other War), and Jerry Peterson (chapters 11-12, The Last Good Man). June 11: Andy Pfeiffer, scene from novel; Ruth Imhoff, scene from The Motto of the Hound; Ray Woodruff, scene from novel; Carol Hornung, scene from Ghost of Heffron College; Jen Wilcher & Rebecca Rettenmund with a report on the Writer’s Institute they recently attended, Carol Hornung with an update on the publication of Asperger Sunset and what it’s like to work with Create Space. Next Fifth Tuesday . . . Put it on your calendar now. Our next Fifth Tuesday is July 30. First-and-third group hosts. The place is not yet set, but the writing challenge is . . . Fortune cookie fortunes. You select a fortune from a list we will provide you on or about July 1, then write a story, poem, or essay in which you use the fortune in some way. Length? Our ever popular 250 words or less. The former Booked for Murder bookstore in Madison has a new name, Mystery to Me. Its new owner, Joanne Berg, is moving the store to 1863 Monroe St. Grand Opening on June 15th. Recently, LouAnn talked about creating a form on your blog to engage with your readers — to ask for feedback or guide your discussions. Today, let’s chat about adding a poll, which is another interactive way to gather information from your site visitors. WordPress.com is integrated with a popular poll service called Polldaddy, so you can create a poll right in your dashboard. When you create a poll, you ask one multiple-choice question and create predefined answers from which your readers can choose. The feature is quite handy if you’re looking for specific feedback and want your readers to weigh in on a discussion. You can add a poll to a post, page, or even your sidebar — and configure its settings to suit your needs. So, a poll can be a straightforward way to collect feedback from your readers — in this instance, to see what works and what doesn’t. 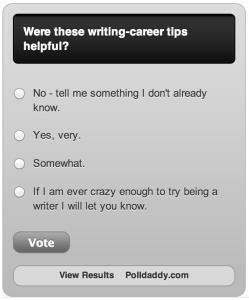 Editor and linguist Stan Carey uses polls to inform his own research and work. Over at his blog, Sentence first, he explores the history, usage, and quirks of the English language, and his discussions on its evolution — especially in this digital age — are provoking and entertaining. 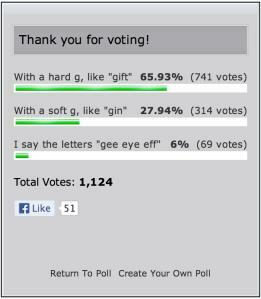 In a recent post on GIFs, he asked his readers: How do you pronounce GIF? Photographer Ming Thein has a comprehensive site for photography, full of commentary, photo essays, tutorials, reviews, and more. Ming leads workshops, and recently added polls to a post to ask readers their location preferences for upcoming sessions in Europe. He includes two polls: one to gauge interest for workshops in various cities, from Prague to Munich, and a second one underneath for voters to specify a time during the fall. Here, you can see how a poll can be extremely helpful in project planning and logistics.